Add more: Anice, cardamom, coriander, cilantro, fennel, fenugreek, licorice, mint and turmeric. Simply adding mint leaves to your drinking water can provide a cooling influence. Avoid heating spices: Cayenne, garlic, chilies and black pepper. These are obviously general tips. Individualized recommendations for your specific state of balance and imbalance can be given to you by an Ayurveda expert in your area. 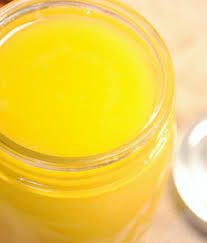 Although most oils increase Pitta, ghee (clarified butter) has the unique property of stimulating digestion and cooling Pitta at the same time. Ghee is a cherished in Ayurveda as a nutritional food for all body types. Ghee does not burn at high temperatures, so it works great as a cooking oil. Coconut water is a great thirst quencher that comes with a long list of health benefits. High in fiber, it aids in the prevention of indigestion. Coconut water contains five essential electrolytes present in the human body: potassium, calcium, magnesium, phosphorous, and sodium. This makes coconut water an excellent choice for rehydrating after exercise. Coconut’s amazing ability to rehydrate was recognized in WWII, where coconut water was actually used for blood transfusions in remote Pacific outposts. Coconut water has a soothing anti-inflammatory effect in our digestive system. Its creamy quality helps soothe inflamed mucosal membranes throughout our entire digestive tract. Try adding some raw sugar, lime and a pinch of cardamom to coconut water for a refreshing summer drink. The aroma of cinnamon rolls in the oven, the smell of cut grass on a summer’s day, the fragrance of a apple blossoms…depending on your body type, each of these aromas will have a different effect on your body. Just as each dosha responds to a different taste, they also respond to different smells. Vata is pacified by warm, sweet, sour aromas, such as basil, orange, rose geranium, clove and other spices. Pitta is pacified by sweet, cool aromas, such as sandalwood, rose, mint, cinnamon and jasmine. Kapha is pacified by warm, spicy aromas, such as juniper, eucalyptus, camphor, clove and marjoram. Because smelling directly affects the hypothalamus (the gland responsible for regulating such processes as thirst, hunger, blood sugar levels, growth, sleeping, walking, and emotions), it has a powerful effect on the entire mind/body system. You may have noticed that smelling a certain aroma can trigger a long-forgotten memory or emotion. This is because aroma directly affects the brain’s limbic system (which directly processes emotions) and the hippocampus (a part of the brain that stores memory). At The Raj Ayurveda Health Spa, specific aroma oils are used during certain Panchakarma Treatments treatments. During the Heart Pichu, for example, aroma oil is used to help people become more settled and to sooth any emotional purification. Aroma oils are also a part of The Raj’s new anti-cellulite treatment, Beautiful Body. Here the essential oils are warming and help to improve circulation, increase metabolism, and stimulate the lymphatic system. Maharishi Aroma Therapy can also be taken as its own separate treatment. A range of VedAroma essential oils are selected by a consultant, based on one’s particular balance of doshas and on specific areas of the physiology that need to be strengthened and supported. Ayurveda has identified aroma oils that help balance both the doshas and subdoshas. Using the ancient technique of pulse assessment, an Ayurveda expert can identify imbalances on these subtle levels of the physiology and advise which aroma oils would best support balanced health. Aroma oils can help address a wide range of issues such as regulating sleep, emotions, headaches, aches and pains, digestion, etc. Aroma recommendations are often a part of the Going-Home-Program given to Raj guests at the end of their stay, to continue their progress at home. For those traveling, Vata-pacifying aromas are helpful for all body types. A small dab of Vata aroma oil, or basil or rose geranium oil on a cotton ball tucked into your airline seat can help smooth the jangles of air travel. Aroma diffusers for the car are a great boon on long trips.